R. Perry Sentell Jr., Marion and W. Colquitt Carter Chair in Tort and Insurance Law Emeritus, retired on July 1, 2004, after over 46 years of teaching and service to the University of Georgia. 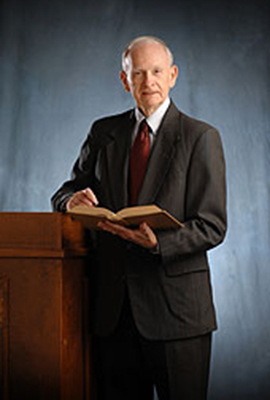 A prolific scholar, Sentell has published nearly 30 books including: Essays on the Supreme Court of Georgia (2004), The Georgia Supreme Court and Local Government Law: Two Sheets to the Wind (1999), Studies in Georgia Statutory Law (1997), The Georgia Negligence Jury (1995), Tales Out of Trial (1995), A Profile: The People and Practice of Georgia Local Government Law (1995), The Law of Municipal Tort Liability in Georgia (4th ed., 1988) and Studies in Georgia Local Government Law (3d ed., 1977). Some of his articles include: "Local Government Liability Litigation: Numerical Nuances" in the Georgia Law Review (2004), "Local Government Litigation: Some Pivotal Principles" in the Mercer Law Review (2003), "Lightening the Load: In the Georgia Supreme Court" in the Georgia Law Review (2003) and "A Six-Member Civil Jury in Georgia? The Trial Judges Weigh In" in the Mercer Law Review (2002). He has also published an annual "Survey of Local Government Law" in the Mercer Law Review since 1963. Several generations of lawyers and policymakers in Georgia have looked to Sentell for guidance on matters pertaining to local government law and torts. He has been honored by the Georgia House of Representatives, the Georgia Trial Lawyers Association and the Georgia Municipal Association for distinguished service to the advancement of legal education. In 1995, he received the Distinguished Service Scroll Award, the highest honor bestowed by the UGA Law School (Alumni) Association. Graduates have selected Sentell 11 times as their class marshal, a distinction given to the law school faculty or staff member whom they most respect. Sentell earned both his bachelor's degree and law degree from the University of Georgia. He later earned a master of laws degree from Harvard University. Local Government Law, 60 Mercer L. Rev. 263 (2008). Local Government Law, 59 Mercer L. Rev. 285 (2007). Local Government Law, 58 Mercer L. Rev. 267 (2006). Official Immunity in Local Government Law: A Quantifiable Confrontation, 22 Ga. St. U. L. Rev. 597 (2006). Torts in Verse: The Foundational Cases, 39 Ga. L. Rev. 1197 (2005). Local Government Law, 57 Mercer L. Rev. 289 (2005). Appellate Conflicts in Local Government Law: The Disagreements of a Decade, 56 Mercer L. Rev. 1 (2004). Local Government Law, 56 Mercer L. Rev. 351 (2004). Local Government Liability Litigation: Numerical Nuances, 38 Ga. L. Rev. 633 (2004). Lightening the Load: In the Georgia Supreme Court, 37 Ga. L. Rev. 697 (2003). Local Government Law, 55 Mercer L. Rev. 353 (2003). Local Government Litigation: Some Pivotal Principles, 55 Mercer L. Rev. 1 (2003). A Six-Member Civil Jury In Georgia? The Trial Judges Weigh In, 54 Mercer L. Rev. 67 (2002). Local Government Law, 54 Mercer L. Rev. 417 (2002). Dissenting Opinions: In the Georgia Supreme Court, 36 Ga. L. Rev. 591 (2002). Statutes in Derogation of the Common Law: In the Georgia Supreme Court, 53 Mercer L. Rev. 41 (2001). Local Government Law, 53 Mercer L. Rev. 389 (2001). The Peculiarity of Per Curiam: In the Georgia Supreme Court, 52 Mercer L. Rev. 400 (2000). Juristic Giants: a Georgia Study in Reputation, 34 Ga. L. Rev. 1311 (2000). Local Government Law, 52 Mercer L. Rev. 341 (2000). The Georgia Supreme Court and Local Government Law: Two Sheets to the Wind, 16 Ga. St. U. L. Rev. 361 (1999). Georgia's Public Duty Doctrine: the Supreme Court Held Hostage, 51 Mercer L. Rev. 73 (1999). Local Government Law, 51 Mercer L. Rev. 397 (1999). Local Government Law, 50 Mercer L. Rev. 263 (1998). The Georgia Home Rule System, 50 Mercer L. Rev. 99 (1998). Tort Claims Against the State: Georgia's Compensation System, 32 Ga. L. Rev. 1103 (1998). The Six Member Civil Jury: In Georgia?, Ga. B. J., October 1998, at 16. Local Government Law, 49 Mercer L. Rev. 215 (1997). Local Government and Constitutional Torts: In the Georgia Courts, 49 Mercer L. Rev. 1 (1997). Local Government Law, 48 Mercer L. Rev. 421 (1996). Georgia Statutory Construction: The Use of Legislative History, Ga. B. J., April 1996, at 30. Appraising the Georgia Negligence Jury, The Verdict, Fall 1996, at 21. Local Government Law, 47 Mercer L. Rev. 225 (1995). Remembering Dean Lindsey Cowen and His Times at Georgia, 30 Ga. L. Rev. xiii (1995). Local Government Law, 46 Mercer L. Rev. 363 (1994). Georgia Local Government Law: A Reflection on Thirty Surveys, 46 Mercer L. Rev. 1 (1994). Local Government Law, 45 Mercer L. Rev. 325 (1993). The Georgia Negligence Jury: The View from the Trenches, 28 Ga. L. Rev. 1 (1993). The Georgia Negligence Jury: Judged by the Judges, 29 Ga. St. B. J. 200 (1993). Local Government Tort Liability: The Summer of '92, 9 Ga. St. U. L. Rev. 405 (1993). The Georgia Jury and Negligence: The View from the (Federal) Bench, 27 Ga. L. Rev. 59 (1992). Local Government Law, 44 Mercer L. Rev. 309 (1992). Local Government Law, 43 Mercer L. Rev. 317 (1991). Georgia County Liability: Nuisance or Not?, 43 Mercer L. Rev. 1 (1991). The Georgia Jury and Negligence: The View from the Bench, 26 Ga. L. Rev. 85 (1991). The Perils of Palsgraf: At Large and at Georgia, 28 Ga. St. B. J. 82 (1991). The Canons of Construction in Georgia: "Anachronisms" in Action, 25 Ga. L. Rev. 365 (1991). Municipal De-Annexation: The Ins and the Outs, 27 Ga. St. B. J. 118 (1991). Survey of Georgia Local Government Law 1989-1990, 42 Mercer L. Rev. 359 (1990). Georgia Local Government Officials and the Grand Jury, 26 Ga. St. B. J. 50 (1989). Binding Contracts in Georgia Local Government Law: Configurations of Codification, 95 Ga. L. Rev. 95 (1989). 'Sue and Be Sued' in Georgia Local Government Law: A Vignette of Vicissitudes, 41 Mercer L. Rev. 13 (1989). Survey of Georgia Local Government Law 1988-1989, 41 Mercer L. Rev. 287 (1989). Local Government Exposure to Local Government Zoning, 25 Ga. St. B. J. 180 (1989). Survey of Georgia Local Government Law 1987-1988, 40 Mercer L. Rev. 303 (1988). Individual Liability in Georgia Local Government Law: The Haunting Hiatus of Hennessy, 40 Mercer L. Rev. 27 (1988). Survey of Georgia Local Government Law 1986-1987, 39 Mercer L. Rev. 275 (1987). Condemning Local Government Condemnation,39 Mercer L. Rev. 11 (1987). Survey of Georgia Local Government Law 1985-1986, 38 Mercer L. Rev. 289 (1986). Lawyers Who Represent Local Governments, 23 Ga. St. B. J. 58 (1986). The Hammer: An Emerging Crisis, 22 Ga. St. B. J. 142 (1986). Georgia Local Government Tort Liability: The "Crisis" Conundrum, 2 Ga. St. U. L. Rev. 19 (1985). Survey of Georgia Local Government Law 1984-1985, 37 Mercer L. Rev. 313 (1985). Of Courts and Statutes and Sanitary Landfills, 21 Ga. St. B. J. 72 (1984). Survey of Georgia Local Government Law 1983-1984, 36 Mercer L. Rev. 255 (1984). Claims Against Counties: The Difference a Year Makes, 36 Mercer L. Rev. 1 (1984). Survey of Georgia Local Government Law 1982-1983, 35 Mercer L. Rev. 233 (1983). "Local Government Law and the Constitution of 1983: Selected Shorts" in Additional Studies in Georgia Local Government Law. (Michie Co., 1983). The United States Supreme Court as Home Rule Wrecker, 34 Mercer L. Rev. 363 (1982). Survey of Georgia Local Government Law 1981-1982, 34 Mercer L. Rev. 225 (1982). The County Spending Power: An Abbreviated Audit of the Account, 16 Ga. L. Rev. 599 (1982). Defamation in Georgia Local Government Law: A Brief History, 16 Ga. L. Rev. 627 (1982). Survey of Georgia Local Government Law 1980-1981, 33 Mercer L. Rev. 187 (1981). Local Government Law and Liquor Licensing: A Sobering Vignette, 15 Ga. L. Rev. 1039 (1981). Workers' Compensation in Georgia Municipal Law, 15 Ga. L. Rev. 57 (1980). County Contracts in Georgia: "Written and Entered," 32 Mercer L. Rev. 283 (1980). Survey of Georgia Local Government Law 1979-1980, 32 Mercer L. Rev. 137 (1980). Codification and Consequences: The Georgian Motif, 14 Ga. L. Rev. 737 (1980). Statutes of Nonstatutory Origin, 14 Ga. L. Rev. 239 (1980). Survey of Georgia Local Government Law 1978-1979, 31 Mercer L. Rev. 155 (1979). Caesar Confronts Caesar: Local Government Property Taxation and Local Government Property, 31 Mercer L. Rev. 293 (1979). Georgia Local Government Officers: Rights for Their Wrongs, 13 Ga. L. Rev. 747 (1979). Unlawful Special Laws: A Postscript on the Proscription, 30 Mercer L. Rev. 319 (1978). Survey of Georgia Local Government Law 1977-1978, 30 Mercer L. Rev. 133 (1978). The Omen of "Openness" in Local Government Law, 13 Ga. L. Rev. 97 (1978). Local Government "Home Rule:" A Place to Stop? 12 Ga. L. Rev. 805 (1978). Strict Products Tort Liability in Georgia: Smudging a Clean Slate, 8 Ga. J. Int'l & Comp. L. 233 (1978). Extraterritorial Power in Georgia Municipal Law, 12 Ga. L. Rev. 1 (1977). Survey of Georgia Local Government Law 1976-1977, 29 Mercer L. Rev. 189 (1977). Remembering Recall in Local Government Law, 10 Ga. L. Rev. 883 (1976). Survey of Georgia Local Government Law 1975-1976, 28 Mercer L. Rev. 169 (1976). When Is a Special Law Unlawfully Special? 27 Mercer L. Rev. 1167 (1976). "Reference Statutes" -- Borrow Now and Pay Later?, 10 Ga. L. Rev. 153 (1975). Selected Oddities in Georgia Local Government law, 10 Ga. L. Rev. 783 (1975). Survey of Georgia Local Government Law 1974-1975, 27 Mercer L. Rev. 141 (1975). Municipal Liability in Georgia: The "Nuisance" Nuisance, 12 Ga. St. B. J. 11 (1975). Binding Contracts in Georgia Local Government Law: Recent Perspectives, 11 Ga. St. B. J. 148 (1975). Municipal Annexation in Georgia: The Contiguity Conundrum, 9 Ga. L. Rev. 167 (1974). Reasoning by Riddle: The Power to Prohibit in Georgia Local Government Law, 9 Ga. L. Rev. 115 (1974). Discretion in Georgia Local Government Law, 8 Ga. L. Rev. 614 (1974). Survey of Georgia Local Government Law 1973-1974, 26 Mercer L. Rev. 177 (1974). Problems of Nothing: Unconstitutionality in Georgia, 8 Ga. L. Rev. 101 (1973). Survey of Georgia Local Government Law 1972-1973, 25 Mercer L. Rev. 177 (1974). Repeals of Repeals: Statutory Musical Chairs, 10 Ga. St. B. J. 41 (1973). Tort Liability Insurance in Georgia Local Government Law, 24 Mercer L. Rev. 651 (1973). Survey of Georgia Local Government Law 1971-1972, 24 Mercer L. Rev. 199 (1973). Local Legislation in Georgia: The Notice Requirement, 7 Ga. L. Rev. 22 (1972). Home Rule: Its Impact on Georgia Law, 8 Ga. St. B.J. 277 (1972). Survey of Georgia Local Government Law 1970-1971, 23 Mercer L. Rev. 147 (1972). Federalizing Through the Franchise: The Supreme Court and Local Government, 6 Ga. L. Rev. 34 (1971). Municipal Annexation in Georgia: Nay-Sayers Beware, 5 Ga. L. Rev. 499 (1971). Municipal Purchasing and Self-Interest: An Update, 7 Ga. St. B. J. 431 (1971). The Electoral Function of State Legislatures: An Illustrative Example, 22 Mercer L. Rev. 1 (1971). Survey of Georgia Local Government Law 1969-1970, 22 Mercer L. Rev. 227 (1971). Delegation in Georgia Local Government Law, 7 Ga. St. B. J. 9 (1970). The Legislative Process in Georgia Local Government Law, 5 Ga. L. Rev. 1 (1970). Survey of Georgia Local Government Law 1968-1969, 21 Mercer L. Rev. 183 (1970). Georgia Municipal Tort Liability: Ante Litem Notice, 4 Ga. L. Rev. 134 (1969). Local Government and Contracts That Bind, 3 Ga. L. Rev. 546 (1969). Self Interest and Municipal Purchasing: How Now? 5 Ga. St. B. J. 309 (1969). Survey of Georgia Local Government Law 1967-1968, 20 Mercer L. Rev. 150 (1969). A Tribute to Professor D. Meade Field, 2 Ga. L. Rev. 323 (1968). Avery v. Midland County: Reapportionment and Local Government Revisited, 3 Ga. L. Rev. 110 (1968). Home Rule Benefits or Homemade Problems for Georgia Local Government? 4 Ga. St. B.J. 317 (1968). Survey of Georgia Local Government Law 1966 -1967, 19 Mercer L. Rev. 114 (1968). Reapportionment and Local Government, 1 Ga. L. Rev. 596 (1967). The Law of Municipal Annexation in Georgia: Evolution of a Concept? 2 Ga. L. Rev. 35 (1967). Survey of Georgia Local Government Law 1965-1966, 18 Mercer L. Rev. 123 (1966). Survey of Georgia Local Government Law 1964-1965, 17 Mercer L. Rev. 126 (1965). Some Legal Aspects of Local Government Purchasing in Georgia, 16 Mercer L. Rev. 371 (1965). Escheat, Unclaimed Property, and the Supreme Court, 17 W. Res. L. Rev. 50 (1965). Survey of Georgia Local Government Law 1963-1964, 16 Mercer L. Rev. 147 (1964). Validity of Statutes Pertaining to Georgia County Commissioners: An Exercise in Constitutional Interpretation, 15 Mercer L. Rev. 258 (1963). Survey of Georgia Local Government Law 1962-1963, 15 Mercer L. Rev. 105 (1963). Cities and Towns in Georgia: A Distinction with a Difference?, 14 Mercer L. Rev. 385 (1963). The Opinions of Hughes and Sutherland and the Rights of the Individual, 15 Vand. L. Rev. 559 (1962). Ante Litem Notice: Recent Perspectives (Georgia Municipal Association, 2006). Essays on The Supreme Court of Georgia (Carl Vinson Institute of Government, 2004). The Georgia Supreme Court and Local Government Law : Two Sheets to the Wind (Georgia Municpal Association, 1999). Studies in Georgia Statutory Law. (Office of Legislative Counsel, Georgia General Asembly, 1997). Local Government Law: Lite (Local Government Law Section, State Bar of Georgia, Georgia Municipal Association and Association County Commissioners of Georgia, 1997). In Pari Materia in Georgia (Carl Vinson Institute of Government, University of Georgia, 1996). The Georgia Negligence Jury (Carl Vinson Institute of Government, University of Georgia, 1995). Tales Out of Trial (Carl Vinson Institute of Government, University of Georgia, 1995). A Profile: The People and Practice of Local Government Law (GMA Press, 1995). Miscasting Mandamus in Georgia Local Government Law (Carl Vinson Institute of Government, University of Georgia, 1989). The Law of Municipal Tort Liability in Georgia, 4th ed. (Carl Vinson Institute of Government, University of Georgia, 1988). The Writ of Quo Warranto in Georgia Local Government Law (Carl Vinson Institute of Government, University of Georgia, 1987). The Law of Estoppel in Georgia Local Government Law (Carl Vinson Institute of Government, University of Georgia, 1985). Georgia Local Government Law's Assimilation of Monell: Section 1983 and the New "Persons" (Michie Co., 1984). Selected Materials in the Law of Municipal Corporations (Materials prepared for the course in Municipal Corporations in the School of Law, University of Georgia, 1983). Additional Studies in Georgia Local Government Law (Michie Co., 1983). The United States Supreme Court as Home Rule Wrecker (Georgia Municipal Association, 1982). Georgia Lawyers Basic Practice Handbook, 2d ed. (Younger Lawyers Section of the State Bar of Georgia and Institute of Continuing Legal Education in Georgia, 1980). The Law of Municipal Tort Liability in Georgia, 3d ed. (Institute of Government, University of Georgia, 1980). Studies in Georgia Local Government Law, 3d ed. (Michie Co., 1977). The Law of Municipal Tort Liability in Georgia, 2d ed. (Institute of Government, University of Georgia, 1972). Studies in Georgia Local Government Law, 2d ed. (Michie Co., 1973). Georgia Municipal Law: Current Trends and Problems (Institute of Government and Center for Continuing Education, University of Georgia, 1971) (with J. Ralph Beaird). Studies in Georgia Local Government Law (Michie Co., 1969). Georgia Appellate Court Decisions Affecting Local Government 1963-1964 (Institute of Law & Government, University of Georgia, 1964). The Law of Municipal Tort Liability in Georgia (Institute of Law and Government, University of Georgia, 1964; 2d printing 1967). Georgia Appellate Court Decision Affecting Local Government 1962-1963 (Institute of Law & Government, University of Georgia, 1963). Handbook for Georgia Legislators, 1st - 3rd eds. (Carl Vinson Institute of Government, University of Georgia, 1958 - 1963). Georgia Appellate Court Decision Affecting Local Government 1961-1962 (Institute of Law & Government, University of Georgia, 1962). A Study of Escheat and Unclaimed Property Statutes (Institute of Law & Government, University of Georgia, 1962). The Supreme Court of the United States, 11 J. Pub. L. 394 (1962). Forward, The Georgia League Report (Vol. VIII, April 2002). Foreword, The Georgia League Report (Vol. VI, April 2000). Foreword, The Georgia League Report (Vol. V, April 1999). Foreword, The Georgia League Report (Vol. IV, April 1998). Foreword, The Georgia League Report (Vol. III, April 1997). Profiling the People, the Practice, and the Substance of Georgia Local Government Law, Proceedings, 43rd Annual Institute for Georgia City and County Attorneys (Sept. 1996). Forward, The Georgia League Report (Vol. II, March 1996). Bills of Attainder in Georgia Local Government Law, Information Series, Ga. Municipal Association (Feb., 1996) and Ga. County Gov't Mag., Feb. 1996, at 14. Introduction, The Georgia League Report (Vol. 1, Issue 1, March 1995). A White Paper: In Defense of the Georgia Negligence Jury. A paper prepared for and upon request of The Georgia Civil Justice Foundation, Jan. 1995. The Georgia League for Rural Enhancement: A Note of Introduction, Ga. County Gov't Mag., July 1994, at 21. Foreward in Georgia State Constitution, Hill (1994). Robert C. Daniel, Jr.: A Personal Note, Ga. County Gov't Mag., Dec. 1993 at 17, and Counties and the Law, Dec. 1993, at 12. The 1992 Georgia State Tort Claims Act (1992; prepared for students taking the course "Law and Legislative Government"). Binding Contracts in County Government -- Never Mind, Ga. County Gov't Mag., March 1991, at 28. Foreword, Georgia Law Of Torts, Adams & Adams, 1989. Local Government Regulation: "Ascertainable Standards" vs. "Unbridled Discretion", Ga. County Gov't Mag., Dec. 1989, at 19, and 1 GMA Information Series, p. 1 (Jan. 1990). "Motive" and "Intent" in Statutory Interpretation: Their Role in Georgia Local Government Law, Urban Ga. Mag., Jan.- Feb., 1989, at 24. Delineating Delegation in Georgia Local Government Law, Urban Ga. Mag., June 1988, at 23, and Ga. County Gov't Mag., Sept. 1989, at 19. Local Government Liability Limitations: "Causation" = "Police Power", Eminent Domain, Urban Ga. Mag., Jan.- Feb. 1987, at 20. Gesticulations of Garcia, Urban Ga. Mag., Oct. 1985, at 33. Torts: A Lyrical Composition, Ga. Advocate, Winter 1985, at 11. Unconstitutionality: Recent Sightings, Urban Ga. Mag., April 1985, at 29. The Georgia City Attorney: An Observation, Urban Ga. Mag., May 1983, at 43. Unpaid Utility Charges: Where is Thy Sting? Urban Ga. Mag., April 1983, at 28. Argumentum Ab Inconvenienti, Urban Ga. Mag., March 1982, at 23. It Hardly Seems Fair, Calendar Call, Vol. 2, No. 2, p. 3, Official Publication of the General Practice and Trial Section of the State Bar of Georgia. When a Mother Hurts Her Young: Local Government Constitutional Protection Against the State. (Part I), Urban Ga. Mag., May 1981, at 31. When a Mother Hurts Her Young: Local Government Constitutional Protection Against the State. (Part II), Urban Ga. Mag., June 1981, at 33. Restrictive Covenants and Zoning: A Dynamic Duo, Urban Ga. Mag., Sept. 1980, at 16. Ante Litem Notice: Cause for Pause, Urban Ga. Mag., Oct. 1978, at 24. The Express Exclusions from Home Rule Powers, Urban Ga. Mag., Feb. 1978, at 13. Municipal Ordinances: Their Extraterritorial Reach, Urban Ga. Mag., Oct. 1977, at 10. Home Rule Revisited, Urban Ga., June 1972, at __. Municipal Purchasing: A Legal Problem, Urban Ga., April 1971, at __. Home Rule in Georgia, Georgia Government Review (1970). Municipal Tort Liability in the Operation and Maintenance of Parks, Urban Ga., March 1970, at __. Contributor of monthly feature page on Georgia towns and law, Georgia's Cities (Jan. 1963 to present). The Supreme Court Decision of 1964 on the Fifth Amendment, contributed to the "Our World Today" feature of the Atlanta Journal (Feb. 28, 1966). Contributor of Title, Georgia General Assembly, to Vol. 13 Encylopedia of Georgia Law, p. 353 (1968).